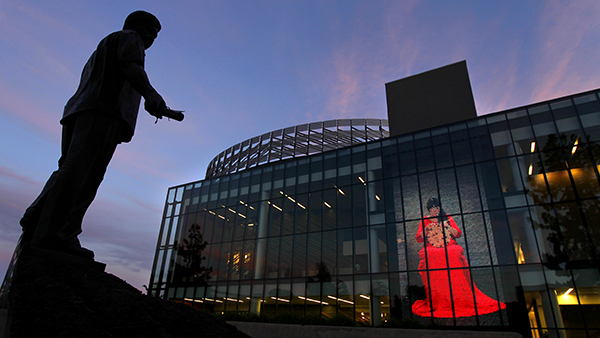 Master basket weaver Lois Conner, a member of the local North Fork Mono and Chukchansi Yokuts tribe, looms over the Peace Garden at Fresno State, projected onto a 43-foot-high media screen on the north side of the Henry Madden Library. With nimble hands, Conner demonstrates the dedication, patience and time it takes to weave a traditional gambling basket, a process that typically takes about a year to complete. On the screen, Conner’s weaving takes a full academic year. Her devotion to her craft reflects the commitment that students and faculty make every day on campus. The video, installed in 2009, was the longest performance art film and first high-tech Mediamesh installation on a university campus nationwide. The year it first played, students watching from the Peace Garden below applauded when the basket was finally completed. The library celebrates the 10th anniversary of the North Wing expansion and building remodel this year. The $105 million project was funded by a $10 million gift from Table Mountain Rancheria, a federally recognized American Indian tribe in the Sierra Nevada foothills near Friant, and by California voters who approved Proposition 55, a bond measure to repair public education facilities.